Please submit feedback, bugs, and ideas! THANKS to Brad and Derek for making this game and still supporting modders! -Compatible with Children Of Storm, Demons & Wizards, XtraDeconstruct (as of .94), and most other mods. Why not play as a Sorcerer, too? Sweet! Thanks for doing this! No worries though, I'm still working on my own stuff at the moment, so it'll be a bit before I take this for a spin. But I digress. This has been added to the Regularly Updated List of Mods for E:LH. Looks like you put a lot of work into this, what with all of the unique quests and such, kudos! The Paladin tree is currently messed up graphically by a bug in the LH v1.6 patch. However, the tree still works correctly, it simply looks jumbled up. This is likely temporary, the <allegiance> tags involved will probably be working again soon. v1.6 is updated and the paladin tree works again! Thanks Derek and Stardock! I'm not seeing paladin as a choice when levelup and I'm using Primal's level up screen modification to show more than 4 (have it set to 8). I am seeing path of ranger and necromancer from 2 other mods, but not paladin. Any idea what I should look for in terms of conflicts since I have a lot of mods going? Does it require a quest to start to provide the option? Can random champions go paladin or only the Sov? No quest required. The path works for any champion: sovereign, champion, even henchmen, and appears with all other choices in the 'select a path' screen, for me. Did you try scrolling down? Are the graphics in the Gfx folder? Try a re-install? I am not sure why it doesn't appear for you. I have the same issue of paladin path not showing - all other 4 are there (ninja, ranger, summoner and necromancer) and there's empty space for 10th path yet no paladin. Should I rename main folder from paladin 0.91 to maybe paladin only? That should not be the issue. Could you possibly give me a list of mods you have installed? Your mod was named paladin mod .91 - I've changed it to 'paladin mod' (removed .91 from the end) only and it appears in game straight after first won battle. Ok. Glad to hear it! I'd love to hear your thoughts on how the class plays. Too powerful? Sure, whenever you feel you have a basis for feedback, I'd love to hear what you think. Updated with some bug fixes for Searing Light and Shadowlance spells. 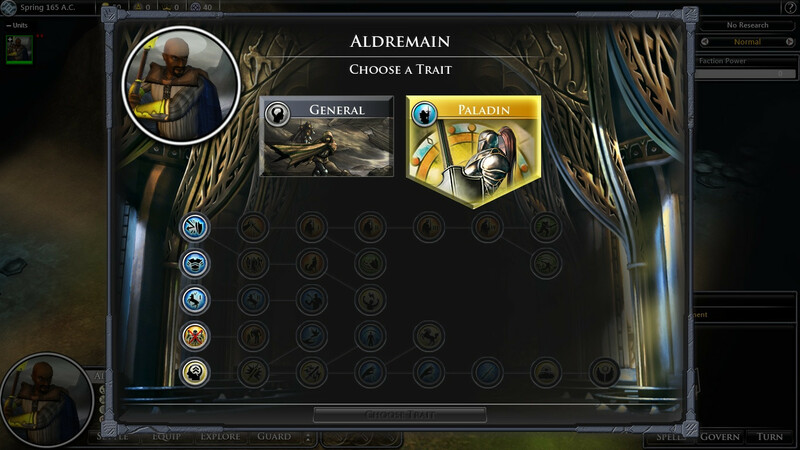 Slightly modified position of icons in the paladin path skill tree. De-powered the soulblade strike ability and slightly reduced the paladin weakness for being in an army over 5. Working well now, renamed the folder - assuming that's what worked. The 'Quest for Justice' spell triggered a quest, but it was the standard kill the bandits for the panca archers quest. Unsure if that was deliberate. Really like the abilities and the way they're laid out. Not sure I like needing the 'sword' that requires modifying all sword items in game - means any other weapon from other mods or other modded swords at all have to be re-modified. Isn't there an existing 'blade' parameter that could possibly be used?. Its also very tough to tell what will be considered a 'sword' via description. Common sense for the most part, but nothing in the descriptions so its the trust that you've caught all the swords being used. Using the mod (I think professions) which has a profession of gladiator - which beefs up attack and move when running solo, so the top tier was a nice synergy and now have a 1 man army. Then I took counterattack line because... solo need to do more damage. Using a non "sword" sword though so not getting all the benefit. Now I'm taking the arcane line. BTW - Nice mount quest! I'll take a look at the ability descriptions and see if I can make the sword requirement clearer. I will strive to make this mod at least Children Of Storm compatible, for version 1.0. As for choosing a parameter, there is no tag I know of that can use the weapon type to give a bonus, only a unitstat makes it possible, and that means adding unitstats to existing weapons. And that means, conflict with any mod that creates new items. I realize I didn't support new DLC swords, but I'll do that before 1.0 releases. Did you play that archers quest all the way through? Because the intended quest starts exactly like the original, but then takes a different turn. doh, no. I went into the archers quest with another champion since he was there and then punted off the 2 move archers to the champion to babysit back to the village... wonder if that's why nothing happened. I'm just waiting to see if HF is going to update the background stats library for 1.6. The best thing would be to add "IsSword" and similar to the background stats library used by COS, then just use that for compatibility. This mod is a terrific piece of work and i have been able to run it with dsraider's Blood and Mana mod w/o crashes. Love the traits and the quests are really well done. Look forward to any future classes you put together.